The X-stream™ Supreme Pneumatic Conveying System (XSPC) is a compressed air operated conveying system that is designed to convey materials that can bunch up and possibly clog with other conveying units like the Ring Vac™. The XSPC has virtually no moving parts, and utilizes compressed air for a powerful, efficient venturi action along its length in a compact design to convey material at high rates and capacity over long distances. Intrinsic straight through design prevents clogging. Simply clamp a standard hose size to each end of XSPC to create this high energy conveying system. It has no moving parts for maintenance free operation with capacity and flow controlled with a pressure regulator. These XSPC’s are made in hard anodized aluminum to be able to handle abrasive materials in standard clamp on versions with internal diameters of 1”, 1-1/4”, 1-1/2” and 2”. Stainless steel versions can be manufactured on request. When clogging could be a concern, these low cost products are an ideal choice. The XSPC’s are compact and lightweight. They are easy to install and portable. The compressed air supply should be filtered to keep the compressed air clean using water removal filters with automatic drains to keep out moisture and oil removal filters with automatic drains if there is oil in the air lines. A regulator installed upstream from the unit will control the pressure, flow rate and velocity of the XSPC. Standard sizes to fit standard hose diameter for easy clamping. Threaded versions connect easily to regular pipe thread: 1″ (25mm), 1-1/4″ (32mm), 1-1/2″ (38mm), and 2″ (51mm). Special sizes can be manufactured if required. 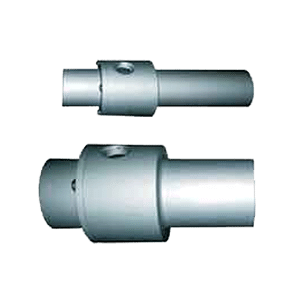 The X-Stream™ Supreme Pneumatic Conveying System (XSPC) – Compressed air enters at point (A) into an annular chamber and is injected into the throat of the unit from the inside wall of the unit through directed nozzles (B). The inside is a straight through design to prevent any clogging of conveyed material. These jets of compressed air create a vacuum at the inlet (C) which draws in material and accelerates it through the unit and out at (D) conveying the material over a great vertical or horizontal distance.